Background & objectives: Ilam province is one of the oldest known endemic foci of zoonotic cutaneous leishmani- asis (CL) in Iran; and the recent studies have shown an increasing trend in the number of cases from the region. This study was aimed to investigate the parasite species and genetic diversity of isolates obtained from CL patients based on the N-acetylglucosamine-1-phosphate transferase (nagt) gene. Methods: Exudate materials were collected from the swollen margin of the skin lesions of the patients suspected with CL who were referred to health centers laboratory of Mehran, Dehloran, Ilam and Malekshahi cities in the Ilam province. Demographic data were collected through a questionnaire. Smears were stained and examined microscopically. In total, 62 parasitologically positive samples were subjected to PCR-RFLP of nagt gene for identification of Leishmania species, in addition to genetic diversity investigation. Results: Nearly, half of the positive cases were referred from Mehran followed by Dehloran City (40.4%). These included people from different age groups (1 to 73 yr), with majority being male (66.1%). The common site of lesions was hand (48.4%). Half of the patients had multiple lesions; most of them were wet ulcerative type. A 1450-60 bp band of the nagt gene was amplified from all the samples. Digestion patterns of acetyl-coenzyme A carboxylase 1 (ACC1) enzyme were similar to what expected for Leishmania major. No difference was observed at the nucleotide acid level or resulting amino acid in nine sequenced samples on the basis of phylogenetic analyses. However, intra- species differences (0.0015) were observed amongst the L. major isolates of present study and the other parts of Iran. Interpretation & conclusion: The findings of this study demonstrated that the main causative agent of CL in Ilam Province is L. major, and there is no considerable heterogeneity among the L. major isolates. Moreover, nagt gene proved to be an efficient marker for differentiating Leishmania species. Further studies with more samples need to be carried out to achieve a more comprehensive result on the genetic variation of L. major isolates. Cutaneous leishmaniasis (CL) is a parasitic disease caused by Leishmania species, which is transmitted through the bites of infected Phlebotominae sandflies; 70 to 75% of global estimated CL cases occurs in 10 countries including Iran. It has a long history in Iran, and recent reports estimates >20000 annual cases, making it a high risk country for leishmaniasis. Three clinical forms of the disease namely, anthroponotic CL (ACL), zoonotic CL (ZCL) and zoonotic visceral L (ZVL) have been reported in the country. The main causative agent of ACL is Leish- mania tropica which is transmitted mainly by the Phlebo- tomus sergenti Parrot, 1917 (Diptera: Psychodidae). The disease still occurs in some large and medium sized cities. The main reservoir host is human, but, sometimes dogs are supposed to be an animal reservoir,,. About 80% of CL cases reported in Iran include ZCL, which is caused by L. major, and transmitted by Ph. papatasi Scopoli, 1786 (Diptera: Psychodidae). This form extends from northeast to central and west of Iran, and affect the southern provinces as well. Out of the 31 provinces, the villages of more than 17 are affected by ZCL. Rodents like Rhom- bomys opimus, Meriones libycus, and Tetera indica are considered as the main reservoirs in different foci,,,. Visceral leishmaniasis, also known as the Mediterranean type, is endemic in different parts of Iran; it is caused by L. infantum and domestic dogs (Canis familiaris) from the Canidae family are the main reservoir hosts. Ilam province, located in the western part of the country, has a border of 425 km with Iraq and is one of the known old foci of ZCL. Recent reports have shown that the incidence of CL has increased in the province. Several contributing factors could be regarded as the main reasons for this increasing trend, including ecological changes, post war disasters, population movement, poor garbage disposal system, insufficient vector and reservoir control, and recent oil and gas exploration activities,. Identification of Leishmania parasite is essential from an epide- miological point of view, and also for precise prognosis of the disease, its control and treatment,. The current study was conducted to assess the present status of CL in Ilam province of Iran, mainly by species identification, and investigation of the genetic diversity of Leishmania isolates using the N-acetylglucosamine-1-phosphate transferase (nagt) gene. This genetic marker has been used by several researchers for similar studies,, This gene is a single copy, highly conserved, and functionally indispensable, which make it a suitable marker for species identification and phylogenetic analysis,. The current study was conducted in Ilam province ( 31°58” and 34°15” N and 45°24” and 48°10” E), located in the west of Iran, which borders Khuzestan province in the south, Lorestan province in the east, Kermanshah province in the north and Iraq in the west, sharing 425 km border. The residents of Ilam province usually travel to Iraq for different reasons like occupation, business, religious tour, or visiting relatives. It has a semi-humid cold climate in the north and a hot arid climate in the south. Mehran and Dehloran City are among the warmest regions of Ilam, and other cities of the province are mountainous with a mild temperature. Samples were collected from the patients who were suspected of CL and consequently have been referred to the health centers laboratory, of Mehran, Dehloran, Ilam and Malekshahi counties between October 2014 and February 2015 [Figure 1]. Informed written consent was obtained from the patients and their information was recorded using a structured questionnaire. Most subjects were residents of the study area. The medical records of the patients showed they mostly acquired the infection locally. Figure 1: Map showing the sampling regions and the geographical location of Ilam province in Iran. The lesions were sterilized with 70% ethanol, and a small incision was made in the swollen edge of the lesions using a disposable lancet. The exudate materials were then air dried, fixed in methanol, stained with Giemsa, and examined for potential presence of the amastigotes under a light microscope. Also, an aspirate from the same lesions was cultured in the Novy-McNeal-Nicolle (NNN) and RPMI 1640 media (Gibco, Life Technologies GmbH, Germany) supplemented with 10–15% heat inactivated fetal bovine serum (Gibco, Germany), 100 U/ml penicillin, and 100 μg/ml streptomycin (Gibco, Germany). Parasitologi- cally positive samples were subjected to molecular assays. Ethics approval for the study was obtained from the Committee of Cellular and Molecular Biology Research Center, Shahid Beheshti University of Medical Sciences, Tehran, Iran (Approval Number: IR.SBMU.MSP. REC.1395.3.5) on June 26, 2016. The patients were informed about the study and accordingly written consents were obtained from them. DNA was extracted using a High Pure PCR Template Preparation Kit (Roche Diagnostics GmbH, Mannheim, Germany) according to the manufacturer’s instructions. The extracted DNA was stored at –20 °C until used. To amplify partial sequence of the nagt gene, specific primers L1 (Forward: 5’ TCA TGA CTC TTG GCC TGG TAG 3’) and L4 (Reverse: 5’ CTC TAG CGC ACT TCA TCG TAG 3’) were used. The amplification was carried out by PCR- ready pre-mix (Taq DNA Polymerase Master Mix RED, Denmark). Amplification reactions were set for a total volume of 25 μl, containing 12.5 μl premix, 1 μl forward and reverse primer (10 pmol), 4 μl DNA templates, and 7.5 μl double distilled water. PCR amplification was done with an initial denaturing step at 94 °C for 1 min, followed by 35 cycles at 94 °C for 1 min, 58 °C for 1 min, and 72 °C for 90 sec. This process was followed by final extension at 72 °C for 5 min. About 3 μl of the amplification products were visualized using agarose gel electrophoresis on the 1% agarose gel (Invitrogen, Life Technologies GmbH, and Germany) stained with Safe stain. Negative and positive controls always monitored the reactions. Standard reference strains of L. major [MRHO/IR/11/GOL-2 (Acc. No. JN860745)] and L. tropica [MHOM/IR/02/Mash10 (Acc. No. EF653267)] obtained from the School of Public Health, Tehran University of Medical Sciences were used as positive controls. The sets of primers (L1 and L4) can amplify a fragment of approximate 1450–60 bp of the nagt gene in Leishmania genus parasites. Species identification was carried out by RFLP analysis. Acetyl- coenzyme A carboxylase 1 (ACC1) (Xmil) enzyme (Fermentas GmbH, Thermo Scientific, Germany) can provide different digestion patterns for different species of Leish- mania. In the next step, 10 μl of the PCR product, 2 μl of the enzyme buffer, 1 μl of the ACC1 (Xmil) enzyme and 17 μl double distilled water were added to the reaction. The mixture was incubated at 37 °C for 12 h and then visualized on 1.5% agarose gel. To study the genetic diversity and phylogenetic relationship, 10 Leishmania isolates were sequenced by the Sanger method in both directions, with the same primers used for amplification by Pouya Gostar Gene Company (www.pggene.com) in a Genetic Analyzer ABI 3730 (Bi- oneer, Daejeon, South Korea). The sequences were checked manually for ambiguities using the BioEdit software version 7.1.3.0. To find similarities, DNA sequences were compared with sequences deposited in the GenBank using the basic local alignment search tool (BLAST) analysis (http://blast. ncbi.nlm.nih.gov). Nucleotide sequences were submitted to the GenBank using Sequin. The genetic distance was calculated and phylogenetic tree was constructed using the neighbour-joining (NJ) method in Tamura parameter option for DNA sequences, and in poisson option for the resulting amino acids sequences using the molecular evolutionary genetic analysis (MEGA) software version 5.1. The sociodemographic data obtained from the questionnaire were analyzed using SPSS software version 16.0. Slide smears were considered positive if Leishmania spp. parasites were visualized microscopically. Among the total collected samples, 62 cases (found parasitologi- cally positive) were also subjected to nagt-RFLP-PCR assay. Grading of Leishmania parasites was done according to WHO protocols on the basis of average parasite density, as follows: 4+ (1–10 parasites/field), +3 (1–10 parasites/10 fields), 2+ (1–10 parasites/100 fields), and 1+ (1–10 parasites/1000 fields). Scoring of the evaluated microscopic slides, showed that more than half of the samples (66.1%) were grade 1+ and 2+. Majority of the patients were referred from Mehran (48.4%) and Dehloran (40.4%) cities, which have common borders with Iraq, as shown in [Figure 1]. The patient’s age ranged from 1 to 73 yr. There was no any patient < 1 yr and only two were > 60 yr. The disease was more common in patients aged between 21 and 30 yr (22.6%). The majority of the patients, were male (66.1%). The most common site of the lesion was hand (48.4%), followed by face (19.5%) and leg (14.5%). Half of the patients had multiple lesions; 27.4 % of them had two and 22.6% had three or more lesions. In one case, nine lesions were observed on the exposed parts of the body. Most of the lesions were of wet ulcerative type [Figure 2]. All of the patients were Iranian and no history of treatment or travel was recorded. 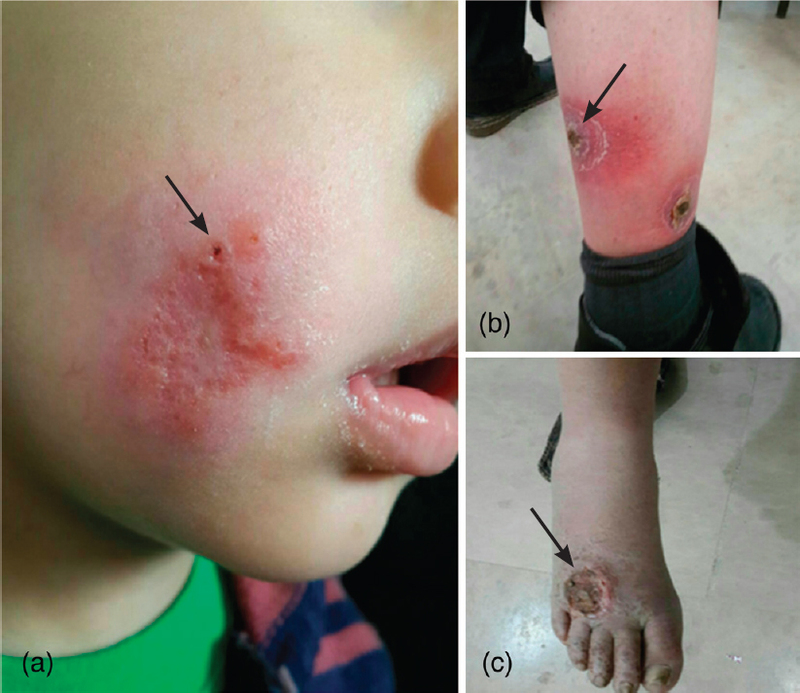 Figure 2: Representative pictures of cutaneous leishmaniasis lesions in (a) cheek; (b) leg; and (c) foot of patients from Ilam province, Iran 2014–2015. Leishmania DNA was detected in all 62 microscopically positive samples in the PCR assay; a single 1450-60 bp band of the nagt gene was amplified in all the samples [Figure 3], which was consistent with the product size of Leishmania genus. Figure 3: Digestion pattern of nagt aplicons of Leishmania spp isolated from cutaneous lesions of the patients of Ilam province using ACC1 enzyme. 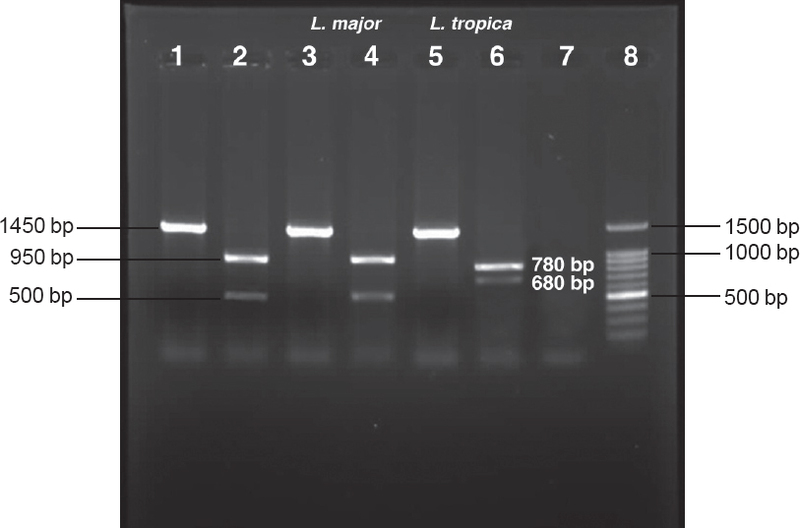 Lines 1–2: Sample of patient (current study) and its ACC1 digestion pattern representative of L.major; Lines 3–4: L. major (MRHO/IR/11/GOL-2) PCR product and ACC1 digestion pattern; Lines 5–6: L. tropica (MHOM/IR/02/Mash10) PCR product and ACC1 digestion pattern; Line 7: Negative control; and Line 8: 100 bp ladder marker. Leishmania species can be easily identified on the basis of the digestion pattern of ACC1 enzyme, which produces two bands of500 and 950 bp for L. major, two bands of 680 and 780 bp for L. tropica, and three bands of 780, 500, and 180 bp for L. infantum. As shown in [Figure 3], ACC1 enzyme digestion pattern exhibited a profile compatible with the L. major in this study [Figure 3]. Despite of several attempts, among 10 samples which were chosen to be sequenced, one failed frequently, so, nine samples were sequenced and deposited in the GenBank by Sequin software (Accession Numbers: KX759007-15). The obtained DNA sequences from chromatogram of 706-1324 bp were subjected to different bioinformati- cal analyses. BLAST showed a 97-100% homology with registered sequences of L. major from Iran (Acc. No: JX103552.1), Tunisia (Acc. No: JN400238.1), and Turkey (Acc. No: AF205931.1). Results obtained from the digestion pattern of ACC1 enzyme were, highly conforming to that of BLAST result. Alignment of the sequences, at the minimum similar length, clearly showed 100% intra-species similarity and no differences were observed. Consequently, there was no difference in the resulting amino-acids. To determine inter- and intra-species similarities, genetic distance was calculated and phylogenetic trees were constructed using the MEGA5 software. As all of our samples were L. major, the nagt sequences of some other species (L. tropica, L. gerbilli, L. turanica and L. infan- tum) were used from the GenBank database to calculate intra-species variation, as well. The intra-species difference between present isolates (from Ilam province) and isolates of L. major from other parts of Iran was calculated to be 0.0015. No differences were observed between present isolates and isolates from Fars and Khuzestan province. However, high differences were observed between isolates of Ilam with isolates from Khorassan-Razavi and Esfahan province (0.005 and 0.003, respectively). The highest interspecies similarity was found between L. turanica and L. gerbilli (0.011) and the lowest (0.042) was between L. infantum and L. major. [Figure 4] shows the phylogenetic tree of the nagt sequences of the Leishmania isolates recovered from the patients with CL and the sequences extracted from the GenBank. All sequences were grouped into four main clades; first clade comprised L. major species, second consisted of L. turanica/L. gerbilli and third and fourth clades represented L. tropica and L. infantum, respectively. The numbers above the branches represent the bootstrap value. Phylogenetic grouping was in complete conformity with the primary PCR-RFLP identification. 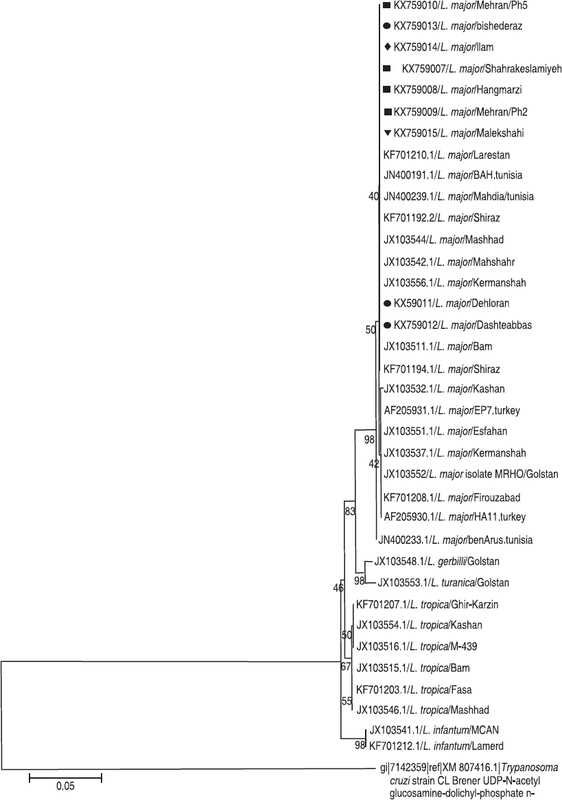 Figure 4: Phylogenetic tree inferred from 1450–1460 bp of nagt gene sequences of Leishmania major isolates from CL patients of present study and other Leishmania species obtained from GenBank; ▪ Mehran; • Dehloran; ♦ Ilam; ▾ Malekshahi County. Leishmaniasis is a global health concern and ZCL is one of the prevailing forms of this disease in Iran. Ilam province is one of the well-known foci of ZCL in the country with a recent increasing trend. In this report we assessed the causative agents of the disease, as well as investigated the genetic variation of Leishmania isolates based on nagt gene. In the study, among the 62 positive patients, the ratio of male patients was higher than female patients, due to their more exposure to sandfly bite, because of the type and time of their occupations, which is in agreement with the results of other researchers,,,. The age group of 21-30 yr was at highest risk, which is consistent with the findings of other studies in other endemic areas,,,. Over half of the patients had > one lesion as also reported in other studies in ZCL endemic foci,. The grading of Leishmania amastigotes showed 1+ and 2+ grades in 66.1% of the cases. Accurate identification of Leishmania species is one of the basic factors in epidemiological studies to adapt control measures in a study area. Parasito- logical methods are not capable of identifying the species of Leishmania parasites. Recently, different molecular assays have been developed for identification of species, and even for assessment of intraspecific variations. N-acetylglucos- amine-1-phosphate transferase gene of Leishmania is a single-copy and highly conserved gene with approximately 1450-60 bp per haploid genome, which encodes N-acetylglucosamine-1-phosphate transferase, a micro- somal transmembrane enzyme whose enzymatic action is the first step of N-glycosylation,. So, in the current study, nagt-PCR-RFLP was used to identify the type of Leishmania species from the clinical isolates obtained from CL patients in Ilam province. The obtained results revealed that the Leishmania species present in all 62 samples was L. major, which is not surprising. Some of the epidemiological findings of this study such as, the presence of multiple lesions in the patients and the wet ulcerative type of lesions showed strong correlation with the type of Leishmania parasite obtained in this study. The same findings were reported in the other ZCL foci in Iran,. Earlier studies in Ilam have reported the dominancy of L. major as the causative agent of leishmaniasis,,. The results of this study showed that Leishmania parasites can be easily distinguished at the species level by targeting the nagt gene (RFLP-PCR or sequencing). Some of the positive samples were chosen to be sequenced for investigation of genetic variation. No genetic variation was observed among the nagt sequences obtained from the isolates of this study. However, it may be noted that other Iranian researchers have reported intra-spe- cies divergence in L. major based on the nagt gene,. The number of samples could influence the results of intra-species diversity; due to the lack of funding, we sequenced only a few samples. Moreover, in the present study, distance between the collection areas was not far, compared to other studies conducted in Iran,. Phylogenetic nagt analysis depicts the efficiency of this gene in differentiating Leishmania species. All of the main causative agents of human Leishmaniasis are grouped distinctly in different clades. Higher association of L. tropica with L. infantum is completely distinct, a finding which is in line with that of other researchers. The results confirmed that the main causative agent of CL in Ilam Province is L. major, which has been reported in other studies as well. There was no heterogeneity among L. major isolates and genetic distance showed similarity with other isolates from ZCL foci in Iran. Hence, it was concluded that the nagt gene can be efficiently used in differentiating Leishmania species. It is also clear that within the clades, L. tropica has a higher association with L. infantum. Further studies with greater number of samples is suggested to achieve a more comprehensive result on the genetic variation ofL. major isolates in the study area. The authors declare that they don’t have any significant competing financial, professional or personal interests that might have influenced the results of the study. This article was extracted from a M.Sc. Thesis submitted by the corresponding author in the Department of Parasitology and Mycology, School of Medicine, Shahid Beheshti University of Medical Sciences, Tehran, Iran (Registration No. 205). This study was funded by the Cellular and Molecular Biology Research Center, Shahid Beheshti University of Medical Sciences, Tehran, Iran (Grant No. 6613). The authors wish to express their gratitude to the staff of Mehran and Dehloran health centers namely, Dr. Ruhollah Yosefvand, and Ms. Mansori for their technical assistance. Alvar J, Vélez ID, Bern C, Herrero M, Desjeux P, Cano J, et al. Leishmaniasis worldwide and global estimates of its incidence. PloS One 2012; 7(5): e35671. Yaghoobi-Ershadi M, Marvi-Moghadam N, Jafari R, Akhavan A, Solimani H, Zahrai-Ramazani A, et al. 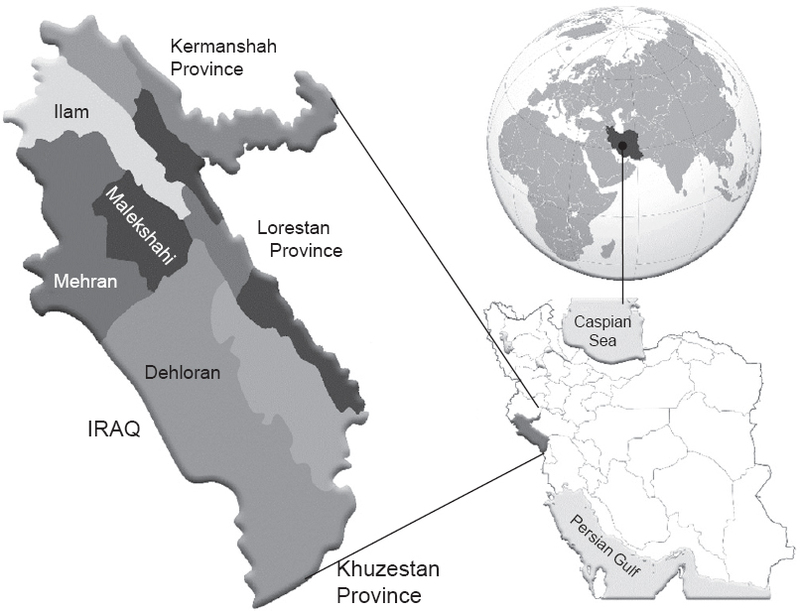 Some epidemiologi- cal aspects of cutaneous leishmaniasis in a new focus, central Iran. Dermatol Res Pract 2015; 2015: 286408. Hajjaran H, Mohebali M, Mamishi S, Vasigheh F, Oshaghi MA, Naddaf SR, et al. Molecular identification and polymorphism determination of cutaneous and visceral leishmaniasis agents isolated from human and animal hosts in Iran. Bio Med Res Int 2013(2013): Article ID 789326. Yaghoobi-Ershadi M. Phlebotomine sandflies (Diptera: Psy- chodidae) in Iran and their role on Leishmania transmission. J Arthropod Borne Dis 2012; 6(1): 1-17. Behravan M, Moin-Vaziri V, Haghighi A, Rahbarian N, Taghi- pour N, Abadi A, et al. Molecular identification of Leishma- nia species in a re-emerged focus of cutaneous leishmaniasis in Varamin district, Iran. J Arthropod Borne Dis 2017; 11(1): 124-31. Shirzadi MR, Mollalo A, Yaghoobi-Ershadi MR. Dynamic relations between incidence of zoonotic cutaneous leishmani- asis and climatic factors in golestan province, Iran. J Arthropod Borne Dis 2015; 9(2): 148-60. Akhavan A, Yaghoobi-Ershadi M, Hasibi F, Jafari R, Abdoli H, Arandian M, et al. Emergence of cutaneous leishmaniasis due to Leishmania major in a new focus of southern Iran. J Arthropod Borne Dis 2007; 1(1): 1-8. Mohebali M. Visceral leishmaniasis in Iran: Review of the epi- demiological and clinical features. Iran JParasitol 2013; 5(3): 348-58. Kermanjani A, Akhlaghi L, Oormazdi H, Hadighi R. Isolation and identification of cutaneous leishmaniasis species by PCR- RFLP in Ilam province, the west of Iran. J Parasit Dis 2017; 41(1): 175-9. Yazdanpanah HA, Rostamianpur M. Analysis of spatial distribution of leishmaniasis and its relationship with climatic parameters (case study: Ilam province). Bull Environ Pharmacol Life Sci 2013; 2(12): 80-6. Kassiri H, Sharifinia N, Jalilian M, Shemshad K. Epidemiologi- cal aspects of cutaneous leishmaniasis in Ilam province, west of Iran (2000-2007). Asian Pac J Trop Dis 2012; 2(1): 382-6. Hajjaran H, Mohebali M, Teimouri A, Oshaghi MA, Mirjalali H, Kazemi-Rad E, et al. Identification and phylogenetic relationship of Iranian strains of various Leishmania species isolated from cutaneous and visceral cases of leishmaniasis based on N-acetylglucosamine-1-phosphate transferase gene. Infect GenetEvol 2014; 26: 203-12. Schönian G, Nasereddin A, Dinse N, Schweynoch C, Schallig HD, Presber W, et al. PCR diagnosis and characterization of Leishmania in local and imported clinical samples. Diagn Mi- crobiol Infect Dis 2003; 47(1): 349-258. Sarkari B, Ahmadpour NB, Motazedian M, Mirjalali H, Ak- houndi M, Mohebali M, et al. Inter- and intra-specific variation of Leishmania strains isolated from patients with cutaneous and visceral leishmaniasis in Fars province, south of Iran. Iran J Med Sci 2016; 41(3): 209-16. Waki K, Dutta S, Ray D, Kolli BK, Akman L, Kawazu S-I, et al. Transmembrane molecules for phylogenetic analyses of pathogenic protists: Leishmania-specific informative sites in hydrophilic loops of trans-endoplasmic reticulum N-acetylglu- cosamine-1-phosphate transferase. Eukaryotic Cell 2007; 6(2): 198-210. Chaouch M, Fathallah-Mili A, Driss M, Lahmadi R, Ayari C, Guizani I, et al. Identification of Tunisian leishmania spp by PCR amplification of cysteine proteinase B (cpb) genes and phylogenetic analysis. Acta Trop 2013; 125(3): 357-65. M. Rezazadeh Shafarudi, “ILĀM i. GEOGRAPHY,” Encyclopaedia Iranica, XII/6, pp. 628-31. Available from: http://www. iranicaonline.org/articles/ilam-i. Tamura K, Peterson D, Peterson N, Stecher G, Nei M, Kumar S. MEGA5: Molecular evolutionary genetics analysis using maximum likelihood, evolutionary distance, and maximum parsimony methods. Mol Biol Evol 2011; 28(10): 2731-9. Basic laboratory methods in medical parasitology. Geneva: World Health Organization 1991. Available from: www.who.int/ malaria/publications/atoz/9241544104_part1/en. Roghani AR, Yasemi MR, Jalilian M, Abdi J, Rezai Tavirani K. Epidemiology of cutaneous leishmaniasis in Ilam province. Res Med 2013; 36(5): 50-3. Nezhad HA, Mirzaie M, Sharifi I, Zarean M, Norouzi M. The prevalence of cutaneous leishmaniasis in school children in southwestern Iran, 2009. Comparative Clin Pathol 2012; 21(5): 1065-9. Kheirandish F, Sharafi AC, Kazemi B, Bandehpour M, javad Tarahi M, Khamesipour A. First molecular identification of Leishmania species in a new endemic area of cutaneous leish- maniasis in Lorestan, Iran. Asian Pac J Trop Med 2013; 6(9): 713-7. Alimoradi S, Hajjaran H, Mohebali M, Mansouri F. Molecular identification of Leishmania species isolated from human cutaneous leishmaniasis by RAPD-PCR. Iran J Public Health 2009; 38(2): 44-50. Karami M, Doudi M, Setorki M. Assessing epidemiology of cutaneous leishmaniasis in Isfahan, Iran. J Vector Borne Dis 2013; 50(1): 30-7. Berman J. Human leishmaniasis: Clinical, diagnostic, and che- motherapeutic developments in the last 10 years. Clin Infect Dis 1997; 24(4): 684-703. Nadim AJE, Mohebali M, Zamen Momeni A. Leishmania parasite and leishmaniasis. III edn. Academic Publication Center 2008. Haddad MHF, Ghasemi E, Maraghi S, Tavala M. Identification of leishmania species isolated from human cutaneous leishman- iasis in Mehran, western Iran using nested PCR. Iran J Parasitol 2016; 11 (1): 65-72.